In 1971 John, Cardinal Heenan of Westminster, on behalf of the Latin Mass Society (of England and Wales), presented a petition to Pope Paul VI seeking a clear ruling to allow the ancient Mass to continue to be said, after the promulgation of the Novus Ordo Missae in 1970. Pope Paul’s response was the ‘English Indult’, which encouraged the bishops of England and Wales to give express permission for the celebration of public Masses according to the former Missal; this was the first of the series of Papal documents favouring the Extraordinary Form which culminated in the Motu Proprio Summorum Pontificum in 2007. The petition was signed by fifty six cultural figures, and is indicative of the alarm aroused, even among non-Catholics, by the suggestion that the former liturgical tradition was to be prohibited. They include many of the foremost writers, critics, academics, and musicians of the day, as well as politicians from Britain’s then three main parties, and two Anglican bishops. The text and signatures (in alphabetical order) were as follows. Signed: Harold Acton, Vladimir Ashkenazy, John Bayler, Lennox Berkeley, Maurice Bowra, Agatha Christie, Kenneth Clark, Nevill Coghill, Cyril Connolly, Colin Davis, Hugh Delargy, +Robert Exeter, Miles Fitzalan-Howard, Constantine Fitzgibbon, William Glock, Magdalen Goffin, Robert Graves, Graham Greene, Ian Greenless, Joseph Grimond, Harman Grisewood, Colin Hardie, Rupert Hart-Davis, Barbara Hepworth, Auberon Herbert, John Jolliffe, David Jones, Osbert Lancaster, F.R. Leavis, Cecil Day Lewis, Compton Mackenzie, George Malcolm, Max Mallowan, Alfred Marnau, Yehudi Menuhin, Nancy Mitford, Raymond Mortimer, Malcolm Muggeridge, Iris Murdoch, John Murray, Sean O’Faolain, E.J. Oliver, Oxford and Asquith, William Plomer, Kathleen Raine, William Rees-Mogg, Ralph Richardson, +John Ripon, Charles Russell, Rivers Scott, Joan Sutherland, Philip Toynbee, Martin Turnell, Bernard Wall, Patrick Wall, E.I Watkin, R.C. Zaehner. Cf. Congregation for the Doctrine of the Faith ‘Doctrinal Note on Some Aspects of Evangelization’ 6: ‘Although the Gospel is independent from any culture, it is capable of infusing all cultures, while never allowing itself to be subservient to them.’ This passage ends with a footnote reference to Pope Paul VI Evangelii nuntiandi (1975) 19-20. Ibid: ‘ “Conversion” (metanoia) means exactly the opposite: to come out of self-sufficiency to discover and accept our indigence’. Pope Benedict XVI, Address to the Bishops of New York State, 26th November 2011. These remarks are introduced by a reference to the new translation of the Missal. Pope Benedict XVI (Joseph, Cardinal Ratzinger) Address to Catechists and Religion Teachers. He also says: ‘God cannot be made known with words alone. …To proclaim God is to introduce the relation with God: to teach how to pray.’ Cf. Nichols op. cit. pp81-86 who argues that the liturgy can be a force to restore the sense of the sacred, of hierarchy and so on which is generally lacking in modern society: ‘by worship our Christian selves are forged’ (p84). Bl. Pope John Paul II, Address to the Plenary Session of the Congregation for Divine Worship and the Discipline of the Sacraments, September 21, 2001. Bl. Pope John Paul II Ecclesia in Europa 60. ‘Nor should we overlook the positive contribution made by the wise use of the cultural treasures of the Church. These can be a special element in the rekindling of a humanism of Christian inspiration. When properly preserved and intelligently used, these living testimonies of the faith as professed down the ages can prove a useful resource for the new evangelization and for catechesis, and lead to a rediscovery of the sense of mystery. … artistic beauty, as a sort of echo of the Spirit of God, is a symbol pointing to the mystery, an invitation to seek out the face of God made visible in Jesus of Nazareth.’ Cf. Pope Paul VI Evangelii nuntiandi 51: ‘An almost indefinite range of means can be used for this purpose: explicit preaching, of course, but also art…’ (‘Ad hunc enim finem assequendum adhiberi potest series paene interminata subsidiorum, veluti praedicatio aperta, quemadmodum liquet, sed etiam ars.’) Pope Paul VI is quoting himself: ‘Address to the Members of the Consilium de Laicis’ (1974): AAS 66 (1974), p. 568. Sir Harold Mario Mitchell Acton KBE (1904-94) Catholic historian, writer and poet. Vladimir Ashkenazy (1937-) non-Catholic conductor and pianist. Sir Lennox Berkeley (1903-89) Catholic convert, composer. Sir Maurice Bowra (1898-1971) non-Catholic academic; President of British Academy. Dame Agatha Christie DBE (1890-1976) non-Catholic writer. Kenneth, Baron Clark, OM, CH, KCB, FBA (1903-83) Art Historian and broadcaster (a deathbed Catholic convert). Nevill Coghill (1899-1980) literary scholar. Cyril Connolly (1903-74) non-Catholic critic and writer. Sir Colin Rex Davis, CH, CBE (1927-) non-Catholic conductor. Hugh Delargy (1908-76) Catholic Member of Parliament (sitting for the Labour Party). Robert Mortimer (1902-76) Anglican Bishop of Exeter. Miles Francis Stapleton Fitzalan-Howard, Order of Pius IX, KG, GCVO, CB, CBE, MC, DL, GCPO, Earl Marshal, 17th Duke of Norfolk (1915-2002). Constantine Fitzgibbon (1919-83) Catholic historian. Sir William Frederick Glock, CBE (1908-2000) non-Catholic music critic (BBC Controller of Music, Controller of the Proms). Magdalen Goﬃn (1923-) Catholic writer. Robert von Ranke Graves (1895-1985) non-Catholic poet, scholar, and writer. Graham Greene, OM, CH (1904-91) lapsed Catholic convert and author. Major Ian Greenlees (1913-88) Catholic author and academic, Director of the British Institute, Florence. Joseph, Baron Grimond, CH, CBE, TD, PC (1913-93) non-Catholic barrister, writer, politician (leader of the Liberal Party). executive (BBC Controller of Third Programme). Sir Rupert Hart-Davis (1907-99) non-Catholic publisher and writer. Dame Barbara Hepworth (1903-75) non-Catholic sculptor. John Jolliﬀe (1929-85) non-Catholic, academic and later Head of the Bodleian Library, Oxford. David Jones (1895-74) Catholic convert, artist and poet. Sir Osbert Lancaster (1908-86) cartoonist. Francis Raymond Leavis, CH, (1895-1978) non-Catholic literary critic and writer. Cecil Day-Lewis CBE (1904-72) non-Catholic poet; British Poet Laureate. Sir Edward Montague Compton Mackenzie, OBE (1883-1972) Catholic convert and writer. George Malcolm, KSG, CBE (1917-97) Catholic musician and conductor; Master of Music at Westminster Cathedral. Sir Max Edgar Lucien Mallowan CBE (1908-78), Catholic, Professor of archaeology and Fellow of All Souls. Alfred Marnau (1918-99) Catholic poet and author, the co-ordinator of the petition. Yehudi Menuhin OM, KBE (1916-99) non-Catholic conductor and violinist. Nancy Mitford, CBE (1904-73), non-Catholic writer. Raymond Mortimer (1895-1980) lapsed Catholic convert, writer and editor of the New Statesman. Thomas Malcolm Muggeridge (1903-90) Catholic convert, writer. Dame Iris Murdoch (1919-99) non-Catholic philosopher and novelist. John Murray (1898-1975) Anglican theologian. Sean O’Faolain (1900-91) Catholic academic and writer. Edward James Oliver (1911-92) Catholic convert and biographer. Julian Edward George Asquith, 2nd Earl of Oxford and Asquith, KCMG (1916-2011) Catholic colonial administrator. William Plomer (1903-73) non-Catholic writer. Kathleen Raine, CBE (1908-2003) non-Catholic poet and writer. William, Baron Rees-Mogg (1928-) writer and journalist (editor of The Times). Lt-Cdr Sir Ralph Richardson (1902-83) Catholic actor. John Moorman (1905-89) Anglican Bishop of Ripon. Charles Ritchie Russell, Baron Russell of Killowen (1908-86), Catholic, Lord Justice of Appeal, later Lord of Appeal in Ordinary. Dame Joan Alston Sutherland, OM, DC, OBE (1925-2010) non-Catholic soprano. Theodore Philip Toynbee (1916-81) non-Catholic journalist and writer. Martin Turnell, scholar and writer. Bernard Wall (1908-74) Catholic publisher and writer. Major Sir Patrick Henry Bligh Wall, KBE, MC, VRD (also awarded the Legion of Merit by the USA) (1916-98) Catholic Member of Parliament, sitting for the Conservative Party. Edward Ingram Watkin (1888-1991) Catholic convert and writer. Robert Charles Zaehner (1913-74) Catholic convert, academic, and writer. Excellent article, thank you for posting this. What an indictment of "modern" and "today's" Man. THE PEOPLE OF GOD NEED TO SEE PRIESTS AND DEACONS BEHAVE IN A WAY THAT IS FULL OF REVERENCE AND DIGNITY, IN ORDER TO HELP THEM TO PENETRATE INVISIBLE THINGS WITHOUT UNNECESSARY WORDS OF EXPLANATIONS. IN THE ROMAN MISSAL OF SAINT PIUS V, AS IN SEVERAL EASTERN LITURGIES, THERE ARE VERY BEAUTIFUL PRAYERS THROUGH WHICH THE PRIEST EXPRESSES THE MOST PROFOUND SENSE OF HUMILITY AND REVERENCE BEFORE THE SACRED MYSTERIES. THEY REVEAL THE VERY SUBSTANCE OF THE LITURGY. Beautiful words and very true. Yet then he continued to support and promote only the banal Novus Ordo. 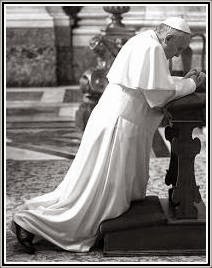 So often our recent Popes speak beautiful words, yet some of the things they do, or do not, belie their words. Something is very wrong with this picture. "This experience, of seeing clearly at last what lies at the root of Western culture, despite all the attempts to abuse and belittle it, is of profound importance. The philosopher Alasdair MacIntyre describes the experience of a person who encounters the culture and set of beliefs which, he suddenly realises, is what he has been groping towards himself, as ‘the shock of recognition’". That's kind of what happened to me...but I could not have put it into those fine words. What a grace! "..the liturgy, though it must always be properly inculturated, must also be counter-cultural." Unfortunately, liturgical inculturation has disembodied the Roman Catholic liturgical tradition. This quotation forms the basis for liturgical revolution to any liberal. Read the quotation and see it as it really is. It does not encourage The Latin Mass at all but the type of liturgies we have had to tolerate seeing on this blogsite and on other Traditional Catholic websites. The Traditional Latin Mass brings Catholics to a period in which Faith and Reason were one. Modern humanistic culture seeks to separate Science from Religion. This became a disaster with the French and Communist revolutions. 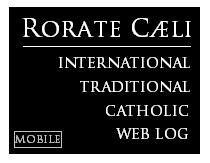 Vatican Council II tried to bring our rituals in phase with the culture of modern man. From the resulting devastation we can see that trying to assimilate to our enemies was a disaster. Every time we as faithful attend a Latin mass we help keep the liturgy of when the Faith and Culture were not opposed. The EF mass may yet save the Church and make the NO more respectful. Since the aggiornamento of VC2 something happened: the Culture, which was Western although anti-Catholic, fragmented into Multiculturalism. Everything is the same, nothing is better. The Catholic liturgy tried to follow many divergent paths trying to adapt to rapidly changing microcultures. Almost every parish one attends today has a different Ordinary Form. The EF mass does remind us of the Universal nature of the Church. To effect a New Evangelization in previously Christian nations one would need to restore Western Culture. This is impossible for the Church to do, much better to restore islands of traditional Catholic belief that will restore Western culture at least for those that participate. Embracing a changing secular culture is a mistake for the Church. We should embrace the Communion of Saints in continuity with our 2000 years of history. Of note, the Agatha Christie indult given in 1971 was only for the 1965 Missal as modified by Tres Abhinc Annos in 1967. A great dissertation on the Faith continues. Such a treat to be able to read these as they become available. At the same time I wonder whether we have reached the tipping point with the way things are and the the way they should be. Can we regain what we have lost, culturally, morally, religiously, etc.? Never say never with God, of course, but at the moment, things do look pretty bleak. and there are certain moments, certain matters The Lord leaves for man to remedy.